Like many of my fellow cat bloggers, I regularly play along with The Cats from Hell's weekly Finish the Sentence Game. The lucky winner receives an amazing cartoon drawing by Nellie's talented mom. 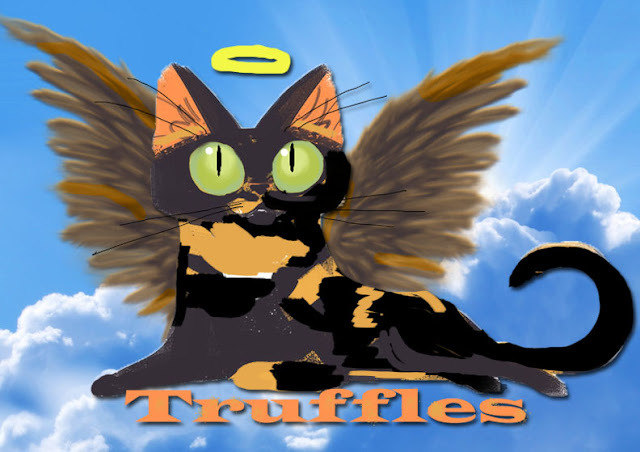 I've never been fortunate enough to win, but I was so honored to turn on my computer one morning to find an email from Nellie's human with a drawing of Angel Truffles. It is incredibly beautiful and I will treasure it always. Check out more artsy kitties at Athena's Caturday Art blog hop. 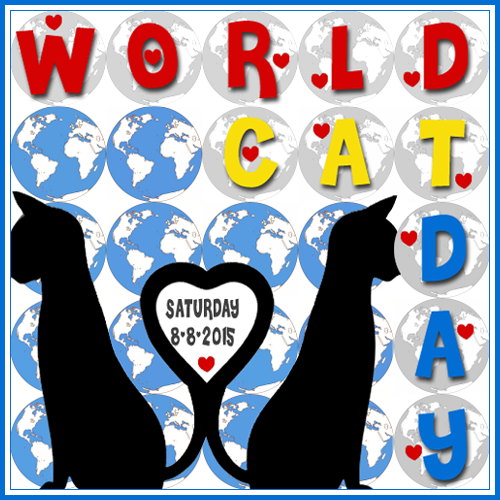 Many thanks as well to Ann at Zoolatry for the World Cat Day graphic...how are you celebrating? Awe that is a cool drawing! That was so sweet of Nellie. Truffles came out great in that too. Hi, you are invited to share this with . The lady is very talented! WOW, that is a very cool Truffles. Happy Caturday. What a beautiful tribute to Truffles!! that is so beautiful...you should frame that my friend. Wow, this is so perfect and I've Pinned it to my pet loss page. Even though mes Gone Fishing, when mes was checking my emails and saw your post, mes just had to stops by and say HAPPY WORLD CAT DAY, wes LOVED reading Truffle's interviews and wes is honored that yous choosed our cartoon to celebrate World Cat Day (and Truffles)! What a beautiful illustration! Truffles is surely purring over this! Many kitty hugs!! we LOVE Nellie's mom's art! The three of us wish you a VERY Happy World Cat Day! Well that is simply purrfect! What a beautiful gift! We hope your World a Cat Day wa pawsome--we celebrated Coco's 7th birthday yesterday! !